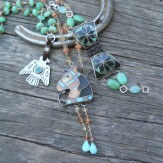 Cayuse welcomes local Jackson Hole artist Dawn Bryfogle with a new grouping of jewelry. These new items are ripe with sunstone, aquamarine, garnet, and opal, and with vintage western pendants and panels featured heavily. Please peruse the collection online, or come to the reception on Friday! More pieces will be added as Dawn delivers them.